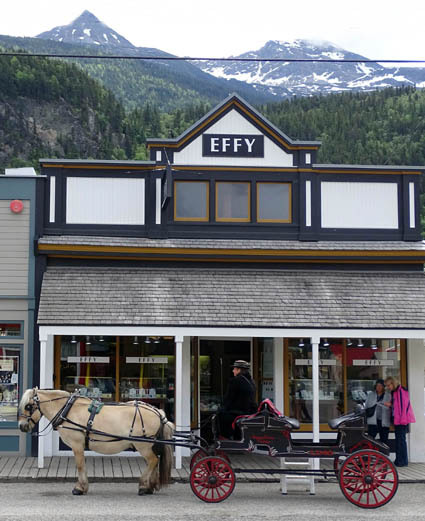 succeeded in preserving Skagway's gold rush atmosphere." What a fun, beautiful day! 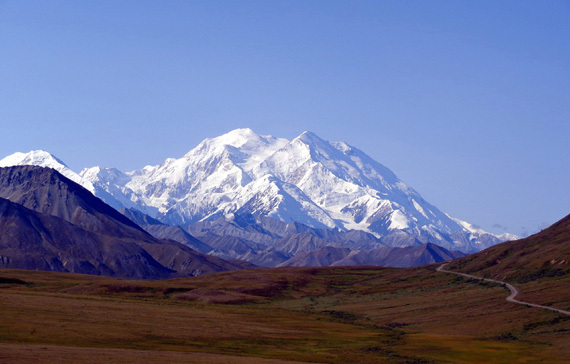 Now we can say we've been in Alaska this summer, although it was for only a couple hours. 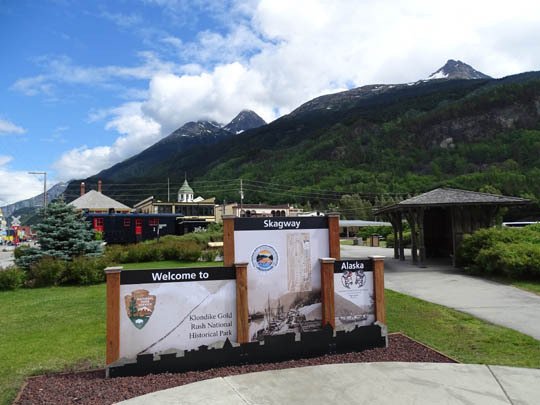 We knew we wanted to visit Skagway this trip since we didn't go there in 2012. 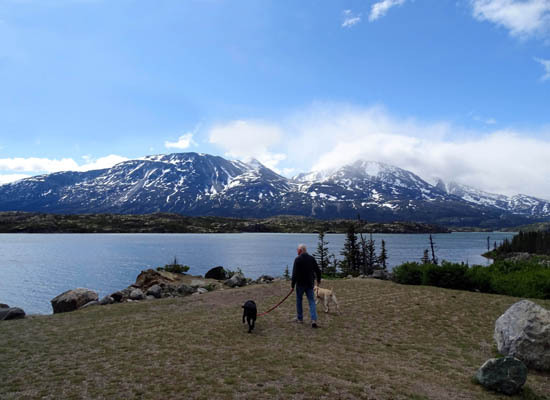 We originally thought we'd take the passenger ferry from Haines when we're there later this week, since it's only a few miles away via water. 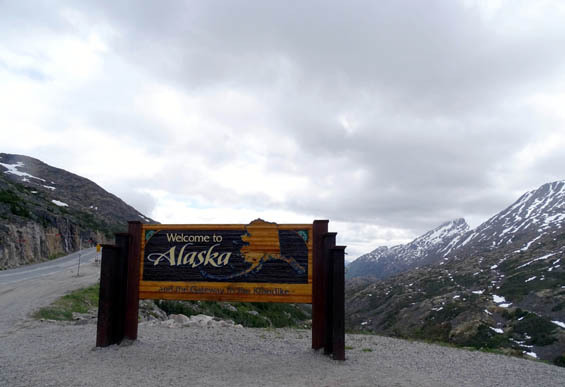 You can see the proximity of the two Alaska towns on the map farther below. 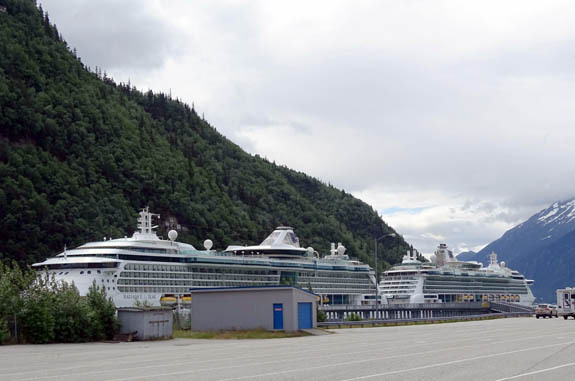 Skagway is the northern terminus of the Alaska Marine Highway's southeastern ferry system that begins in Seattle. 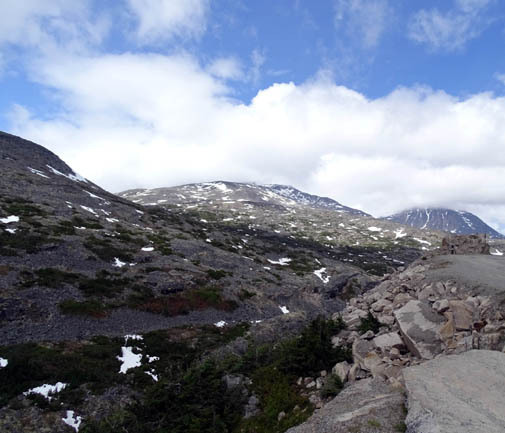 Jim came up with a better idea, though -- he suggested we go down to Skagway from Whitehorse today. 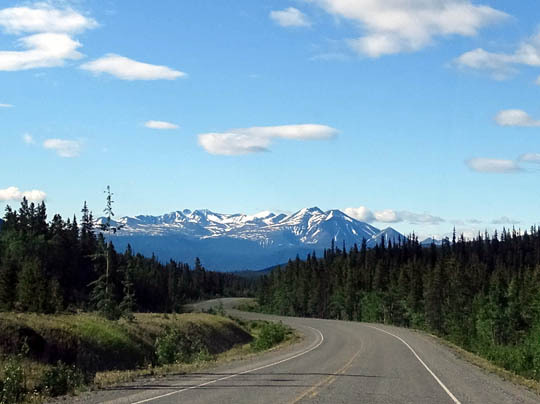 It's a gorgeous 98-mile drive on the South Klondike Hwy., plus about five more miles from our campground south of Whitehorse. We took just the truck, not the camper. 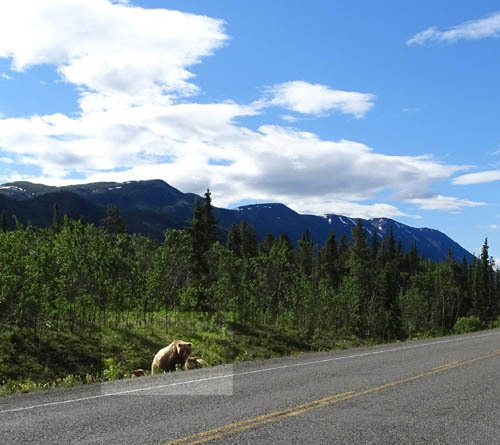 It was a great idea because we got to see spectacular scenery along the road and seven grizzly bears. We would have missed all that on the ferry. In addition, we could take the dogs with us in the truck. 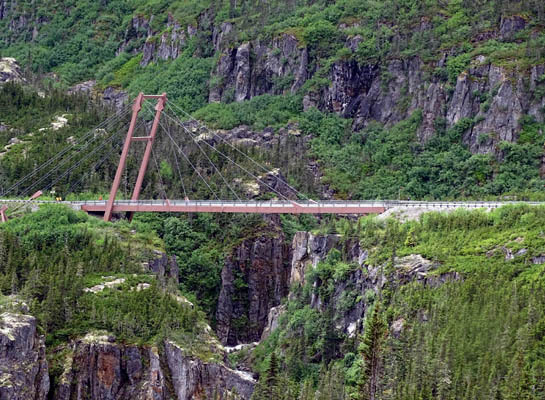 Note that another popular way to visit Skagway besides 1) driving this route yourself, 2) riding on a tour bus, or 3) cruising up the Lynn canal is to 4) take the White Pass & Yukon Route via train. 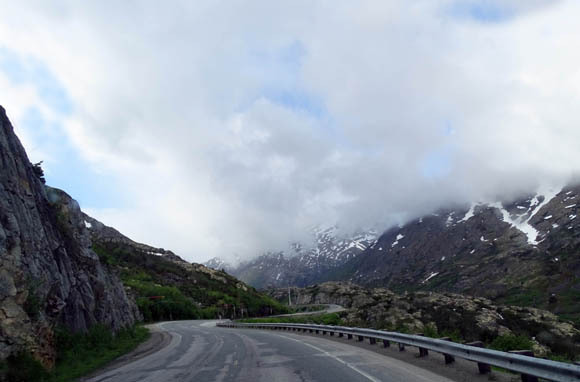 There are no ugly routes to Skagway! You can see a larger version of that map on The Milepost website. 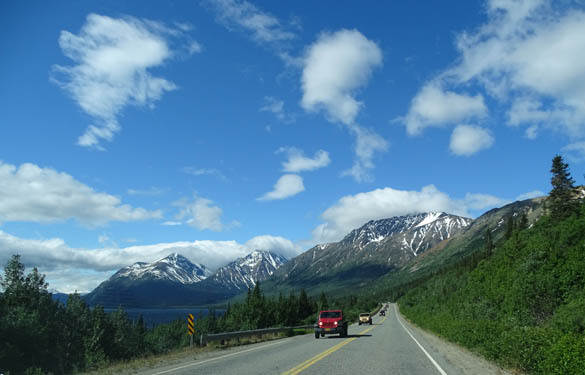 It was a cool, partly sunny day for a drive, with a fair amount of wind along the Klondike Hwy. when we got out to take pictures or walk the dogs. The high point on the South Klondike Hwy. is at White Pass, elevation 3,292 feet. 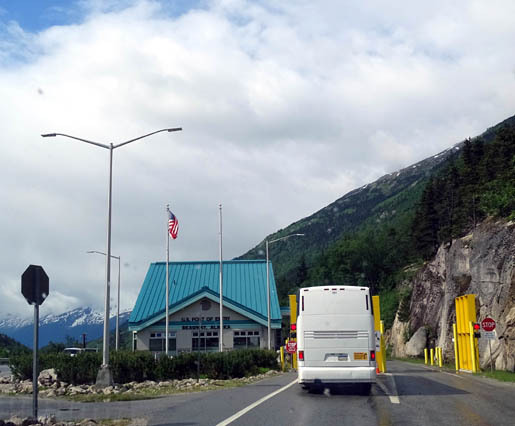 This is also the boundary between British Columbia and the United States, although U.S. customs is farther south and BC customs is farther north in more hospitable territory. 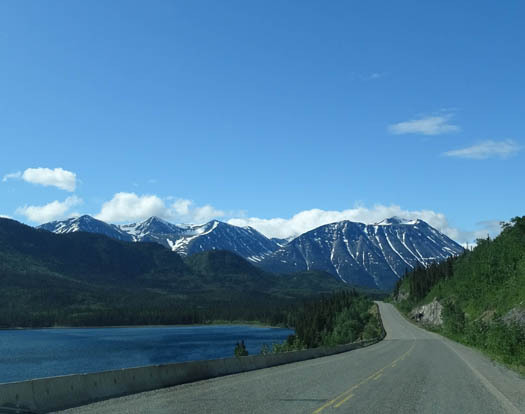 Soon after we turned off the Alaska Hwy. 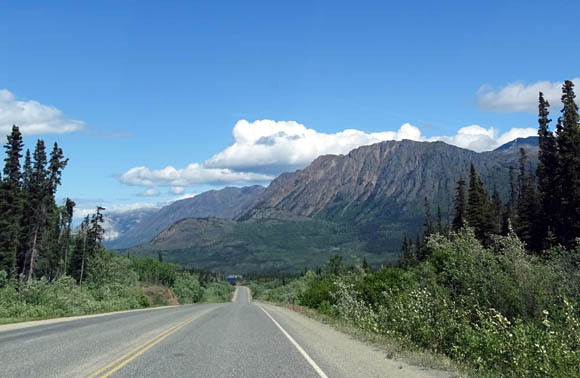 onto the South Klondike Hwy. 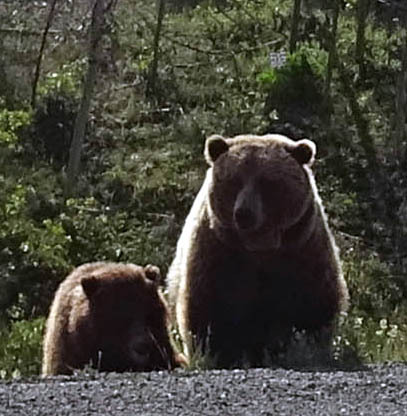 we saw a mama grizzly bear and her three cubs on Jim's side of the road but we didn't get any good pictures of them. We didn't see any more wildlife the rest of the way. 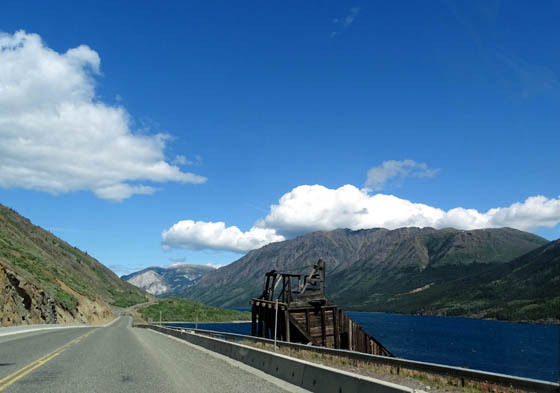 There was minimal traffic on the road, so we could easily stop the truck to take photos whenever we wanted. We saw a few large trucks, several large tour buses, a bunch of little tour buses, a few RVs, and several cyclists in a group. Despite all the tourists it was easy to walk and drive around town and we were the only ones in the Indian restaurant where we had spicy chicken curry for lunch. 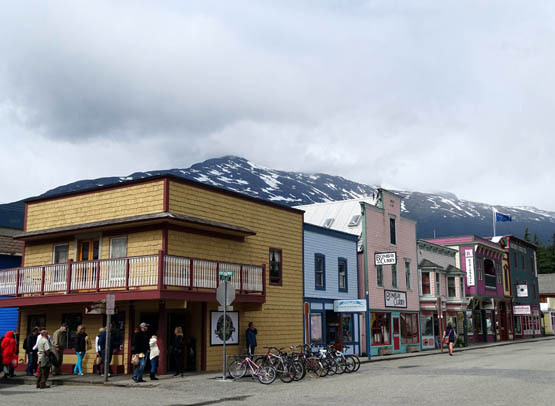 In its short-lived heyday during the Klondike Gold Rush Skagway's population swelled from about zero to over 20,000 people. 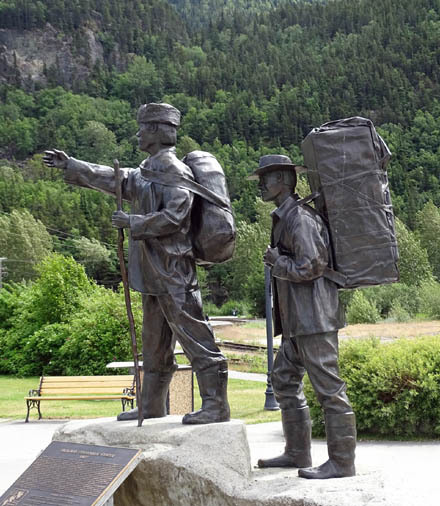 The Klondike Gold Rush National Historical Park was established to preserve and interpret the history of the gold rush in 1897-98. 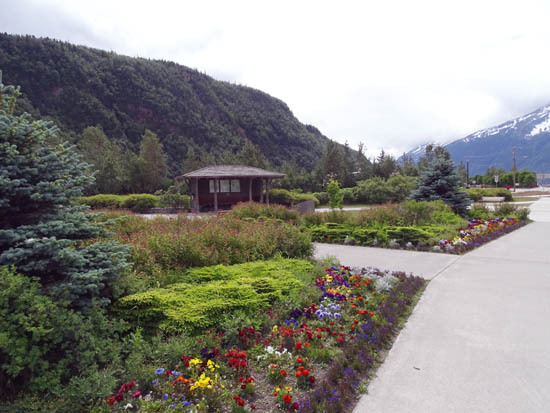 There is a nicely landscaped park between the harbor and town buildings that commemorate the event, and several buildings in the historic district. 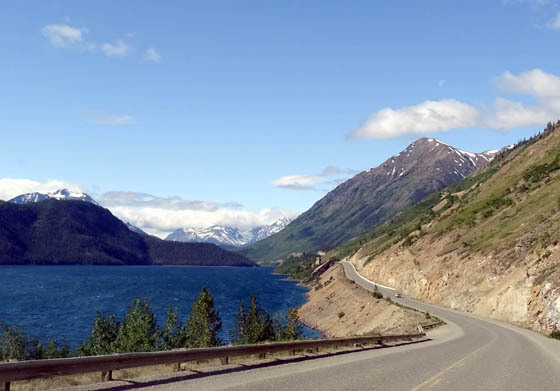 Since the routes to the Klondike also went through British Columbia and the Yukon to Dawson, Yukon, Congress also established units in these two Canadian provinces, making this the only U.S. International Historical Park. Cool, huh? 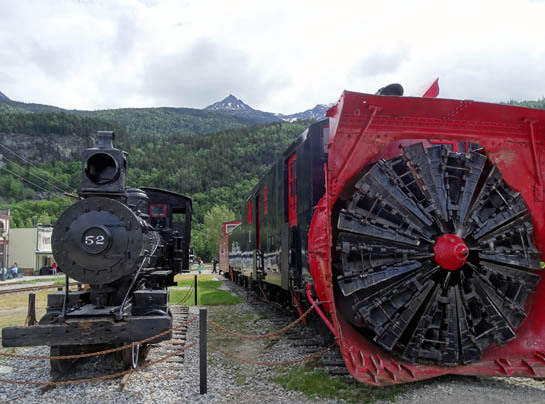 Another one of Skagway's major tourist attractions is the White Pass and Yukon Route (WP&YR) railway. 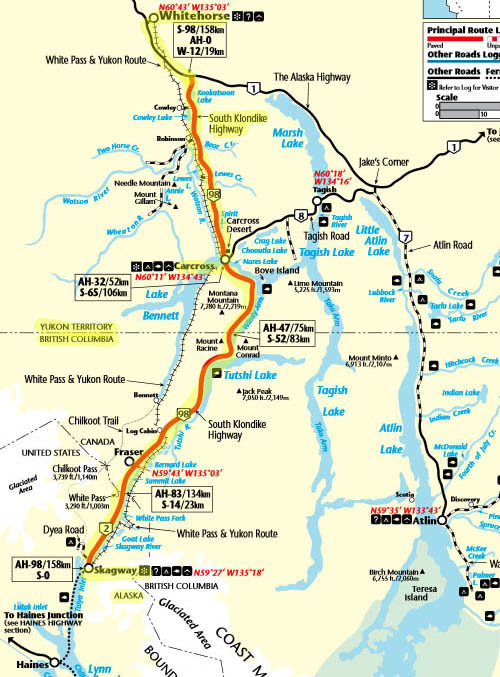 The rail line was begun during the short-lived gold rush as an alternative route to the difficult Chilkoot Trail. After the stampede died the line was extended to Whitehorse to transport ore and freight to and from that city to Skagway's port. I'm not sure if the railway still transports freight or just people. 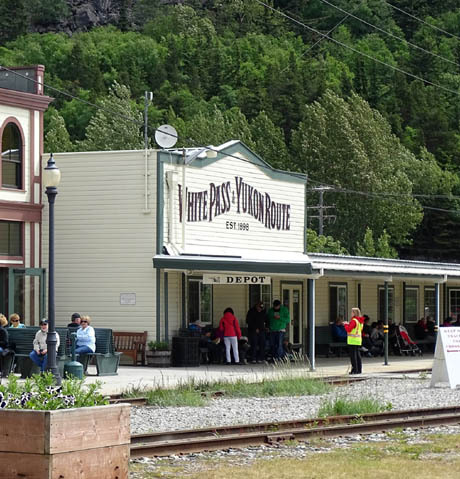 I do know that a popular tourist activity is riding the train from Skagway to White Pass and back, or going all the way to Whitehorse. 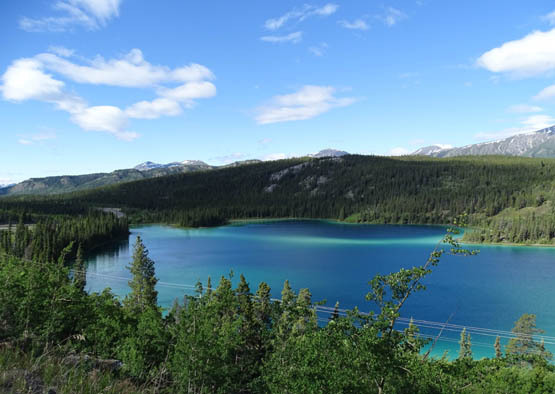 The rail line is in close proximity to the South Klondike Highway most of the way between Skagway and Whitehorse, so I also know it has to be a beautiful ride. 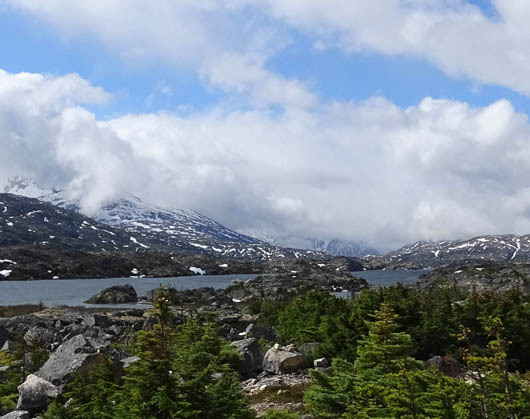 The Klondike Gold Rush didn't last long and within a couple of years the population of Skagway dwindled from about 20,000 people to only about 500 hardy souls. 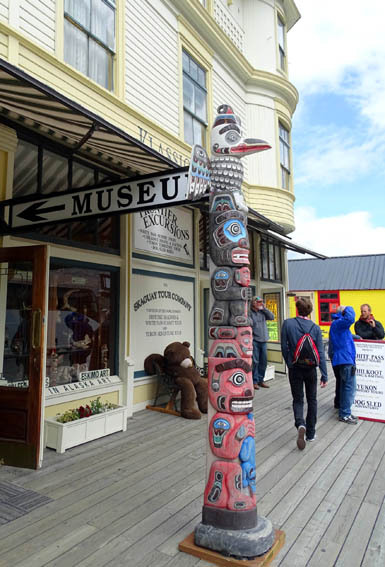 which houses the Skagway visitor center. 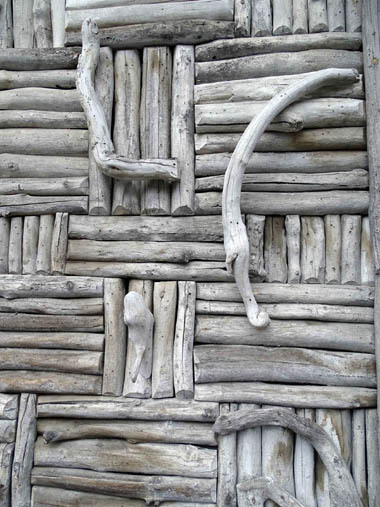 driftwood sticks arranged in a mosaic pattern. At your service, M'am; here's another way to tour the town. 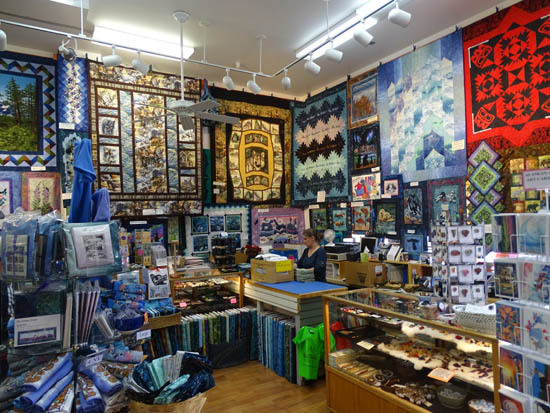 We aren't avid window shoppers but I managed to spend at least half an hour in a well-stocked quilt shop called Rushin' Taylor's Quilt Alaska. 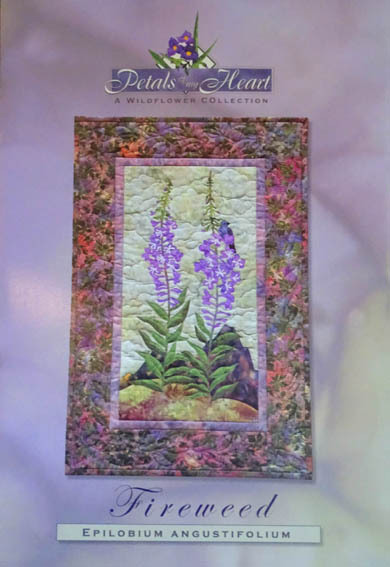 I wanted to find a small wall hanging with an Alaskan motif (moose, bears, mountains, or such) to stitch while we're living in our RV. With my sewing machine, iron, and quilting supplies in storage in Virginia, I can't tackle anything very complicated while we're wandering around North America. Fireweeds are ubiquitous in our favorite northern states and provinces, including AK, CO, BC, and YT. The early ones we've seen so far on this trip have been very short versions by the roadside. We'll see taller fireweed blooming soon. While I was lost in the wonder of beautiful fabrics and quilts, Jim discovered the Klondike Doughboy store a couple doors away. 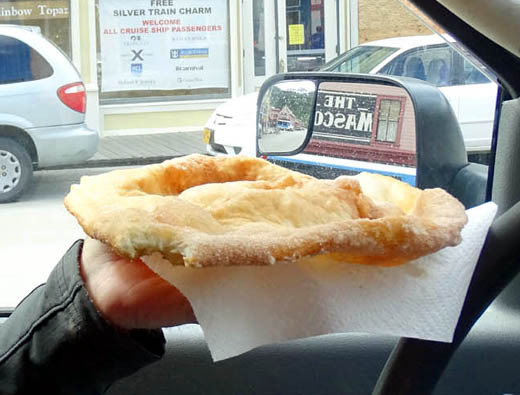 He saved his plate-sized piece of Alaskan fry bread until I came back so I could taste the sugary treat, too. Customs into the U.S. and back into Canada was easy without the camper! Even if we'd been searched it would have been much simpler in just a passenger vehicle. Both border agents looked quickly at our passports, asked us where we live (always harder to explain since we're fulltime RVers! ), asked to see in the back seat (Casey loved that), asked if we had weapons, tobacco, or alcohol, asked how long we'd be there, how we got there (driving vs. cruise ship, I suppose), and that's about it. We didn't know if we should load up on any foods in Whitehorse, since it has larger grocery stores than we'll find in Haines, but we decided to take our chances at the Haines IGA store. We used up our chicken breasts last night for supper and we'll have omelets tonight to use all the remaining eggs. We don't have much produce left. See how that works? 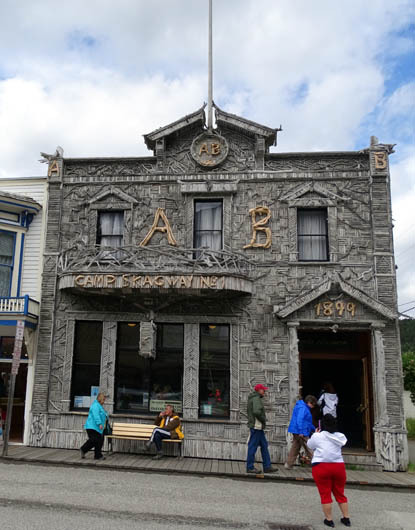 We spent only a couple of hours in Skagway. It was interesting but we enjoyed the scenery on the way to and from the town more than the town itself. After we got back to Whitehorse we got ready for our trip to Haines tomorrow. Jim rode his bike and I took the dogs to Miles Canyon for a hike. 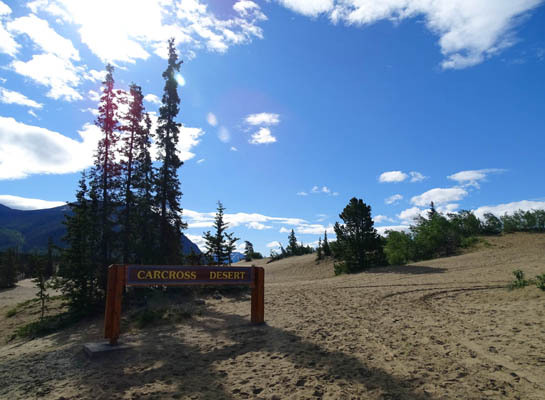 We've enjoyed our time in the Whitehorse area and might come back again to see and do some different things.